When it comes to our Thanksgiving dinner, the bowl of stuffing on the table is more important than the turkey. This year, we’ll be serving this grain-free stuffing. Rather than relying on almond flour to create a mock-bread stuffing, this version relies solely on fresh vegetables and herbs! Dry roasted parsnips act as the bread-like cubes, keeping this recipe lower in carbohydrates and fat than traditional recipes, which often call for a loaf of dry bread and a stick of butter. The result is a looser and lighter stuffing, with all the flavor of the original, but with far less fat and calories. Preheat your oven to 400F and line two baking sheets with parchment paper or a Silpat. Arrange the 4 cups of chopped parsnips into a single layer on one of the lined baking sheets, and arrange the chopped carrots and onion into a single layer on the other lined baking sheet. Roast both pans of vegetables at 400F for about 30 minutes, or until tender. Using a spatula, stir the vegetables half-way through the roasting time, to make sure that they don’t burn. If you find the onions cooking faster than the carrots and parsnips, remove them earlier. While the vegetables are roasting, melt the pat of butter or coconut oil in a skillet over medium heat. 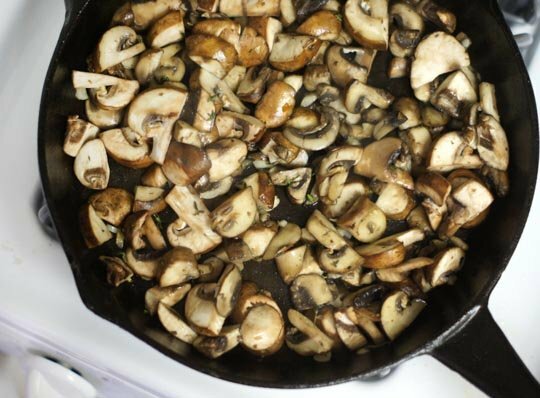 Saute the garlic for 5 minutes, then add in the mushrooms and cook for 8-10 minutes, until tender. Using the food processor, you’ll want to quickly “pulse” the vegetable mixture, so that it combines, but still has a chunky texture. Adjust seasonings to taste, and serve warm! Just like with traditional stuffing, you can easily adapt this recipe to suit your own tastes. 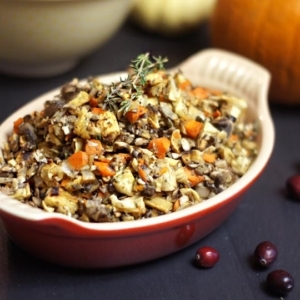 If your family loves fruit or meat in their stuffing, go ahead and add it in! Growing up, my family always added sausage, chopped apples and walnuts. Cranberries or raisins would also be delicious! Rather than relying on almond flour to create a mock-bread stuffing, this version relies solely on fresh vegetables and herbs! Dry roasted parsnips act as the bread-like cubes, keeping this recipe lower in carbohydrates and fat than traditional recipes, which often call for a loaf of dry bread and a stick of butter. The result is a looser and lighter stuffing, with all the flavor of the original, but with far less fat and calories. 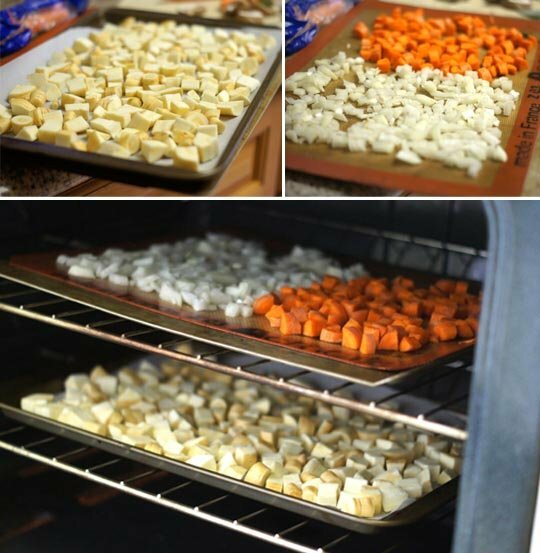 Arrange the 4 cups of chopped parsnips into a single layer on one of the lined baking sheets, and arrange the chopped carrots and onion into a single layer on the other lined baking sheet. Roast both pans of vegetables at 400F for about 30 minutes, or until tender. Using a spatula, stir the vegetables half-way through the roasting time, to make sure that they don't burn. If you find the onions cooking faster than the carrots and parsnips, remove them earlier. Using the food processor, you'll want to quickly "pulse" the vegetable mixture, so that it combines, but still has a chunky texture. Reader Feedback: What are your favorite stuffing ingredients? I’ve been craving stuffing and am limiting grains but didn’t want a bunch of almond flour you taste other texture, this recipe is perfect! I made it tonight and even my traditional stuffing loving husband asked for seconds! So easy toon. Really glad I found this recipe! Looks and sounds great. Megan have you ever tried making ahead and freezing? Anyone have thoughts about how that would work out? This is a delicious recipe. I made it. However, or store was out of parsnips so I substitutes them with turnips. Used shitake mushrooms and I also added sausage. This will be my go to from here on out. Thank you for posting this. My father has recently been put on an extremely restrictive diet. I have been researching recipes like a wild thing lol. Your site has had the most useful recipes of all the sites I have visited! Thank you for having this site and rescuing me from being quite so overwhelmed. This recipe caused me to do some research on parsnips. I am diabetic and thought I should avoid them even though I love them. Even with their high glycemic index they are super duper fibery, so I think a little will be fine for me. I am about to make this recipe now. I think for my own needs, I’m cutting the amount of parsnips down and am going to throw in some radishes and maybe zucchini when I dry roast those veggies. Thank you for this recipe. Happy Thanksgiving!! Super delicious! Thanks so much for sharing! I made it for Thanksgiving, added celery , every one loved it!! Any suggestions for recipes on oxalate, salycilate and amine free (Or even low)? 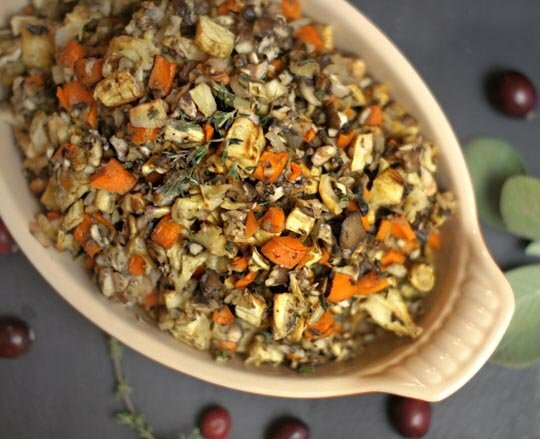 I made this stuffing for Thanksgiving 2012 and will be making it again this year. The taste was so great and it didn’t weigh us down. I’m also going to make one of your desserts. Thanks for your recipes and for your website! Could I possibly incorporate the beaten egg during the actual, first baking the recipe…without having to pre-bake the stuffing first, then re-baking?…Sheer laziness considerations here!..Always looking to “skip” a step if at all possible!…This looks like gluten-free perfection for this Thanksgiving’s table! Can you put this into the bird itself, to roast along with it and develop that amazing turkey stuffing flavor? I’ve never tried that, so I have no idea! But please let us know if you try it! great idea! i LOVE my mom’s cornbread stuffing, but had to stop eating it many years ago when i turned vegetarian/mostly vegan. i assume this doesn’t have that type of taste, right? also, i HATE mushrooms. any idea what i could use as a replacement? Thank you! I added celery and celery salt so it would taste more like my mom’s traditional stuffing. Delicious! This looks AMAZING!! Can’t wait to try!!! Hey Megan, have you had this reheated? If so, how does it hold up? I’m using a few if your recipes for Thanksgiving! All of your recipes (especially these past few weeks) are really inspiring me! What effect did the egg have on it? Did it make it ‘eggy’ as if you we’re eating scrambled eggshell bits? I am interested in the egg addition, but don’t want an eggy stuffing. I beat the two eggs first, then mixed them throughout the pre-cooked stuffing (cooked the night before), so they were fully incorporated in the mixture. Baked for 30 minutes at 350F, it held together really well– there weren’t any bits of egg, like say in a fried rice dish, but I could definitely tell there were eggs holding it together. Next time, I think I’ll try just using one egg, to see if that makes the egg less noticeable. Sheer brilliance….This is THE ONE I will place on the Thanksgiving table…I was searching for HOURS…and for a paleo palate with insulin surge concerns..this recipe totally NAILS it!..For a lower glycemic factor and a fabulous stuffing flavor, I’m going to use celery root cube instead of the parsnips…perhaps adding in chopped celery stalks as well…Thank you so much for your perfectly timed offering. Your site is superlative..I just happened onto it…and it will be a REFERENCE for me in the future. Thank you for your generous sharing of creative, healthy and delicious recipes. Thanks, Donna! The celery root sounds like a delicious substitute, too. Hope you have a wonderful Thanksgiving! I think I could eat this stuf alone. This is great! Originally my loaf was a plant based stuffing. I added the zucchini and tomato paste to the leftovers and turned it into a loaf…I love your step by step pics, makes everything so easy to follow. Books are coming, been a bad shipping week! Yay! Thanks, Doris! Hope your kitchen is doing okay after the storm! i love this! i always end up with a plate of mostly meat at thanksgiving so i’m def going to have to make this 🙂 i actually really love the texture of cooked celery in stuffing. soft..but still a bit of chew..much better tasting than the raw stuff to me! B) I really think that parsnips were neutral – is that not so?? I think parsnips fall into a gray area, when it comes to food combining. I consider them starchy only because they are illegal on the SCD diet, which bans starches, but allows other root vegetables like carrots and beets. I feel like I remember Natalia saying something about how she wouldn’t sit down to a plate of baked parsnips and then eat an omelet, because it would be a bad combination… but my memory could be fuzzy. That being said, I would probably consider this stuffing “neutral” for my own purposes! You are a genius!!! I LOVE Doris’s Mushroom loaf and always want to make it on the holidays but Britney hates mushrooms so I never want to bother just for myself. This is perfect. Also, like Sam mentioned, I’ve always known parsnips to be in the “neutral” category! See my response above to Sam about the combining of parsnips! So, I was randomly looking through my notes from Natalia’s advanced training on a different matter, when a note about parsnips caught my eye! According to my notes, Natalia mentioned that sweet potatoes and parsnips are both neutral when consumed raw. I assume she means that they’re both starchy then, when cooked? hey megan! great recipe- i’m looking to make it tomorrow to bring to thanksgiving! if i wanted to bake it to hold together, what is the egg-based mixture i would use?! thanks!! I just beat two eggs, and added them to the pre-cooked stuffing. (I cooked the stuffing the night before, so mine was cold from the fridge.) Mix really well, so that the eggs are fully incorporated into the mixture. I baked mine for 30 minutes at 350F, but you may need less time if your stuffing is already warm. Also, you may not need two eggs. I think next time I’ll try it with one, to see how it holds together. Definitely an experiment, but my husband loved it with the two eggs added, too!